Located just 28 miles off Lands End, the Isles of Scilly is an archipelago of islands and islets, five of which are inhabited. 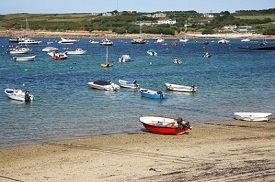 St Mary’s is the largest of these isles and home to three quarters of the island’s 2,000 residents. Just 2½ miles by 1¾ miles, the island is a pocket-sized treasure trove of stunning scenery, historic monuments and quaint local shops.